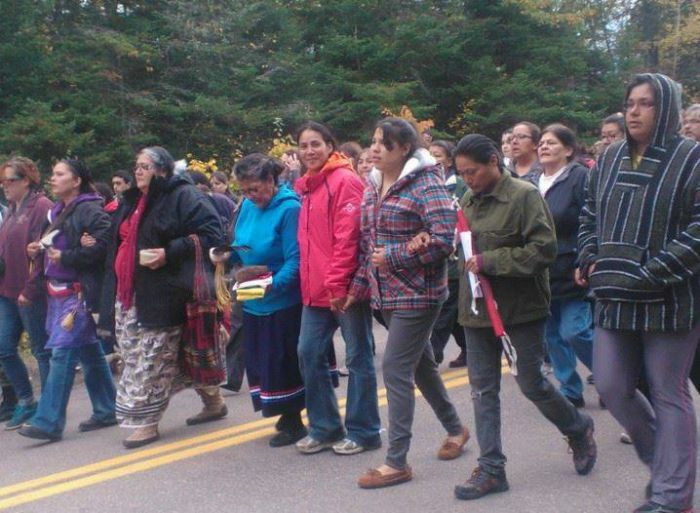 Annie Clair, in centre wearing red jacket, during protests against SWN Resources and RCMP raid on Oct 17, 2013. KJIPUKTUK (HALIFAX) – On April 20th, Elsipogtog First Nation band member Annie Clair will be heading to Moncton to face six charges related to the violent actions of New Brunswick RCMP against defenders of the land in Kent County, New Brunswick. Clair intends to fight the charges. But she is looking to the wider community for help. On October 17th, 2013, RCMP officers with assault rifles at the ready, entered a peaceful anti-shale gas encampment along highway 134, near the town of Rexton, New Brunswick. That encampment was erected to stop Texas-based SWN Resources from exploring for shale gas without proper consent on what remains unceded Mi’kmaq territory. The timing of that cop attack remains suspicious. The injunction supposedly enforced by the RCMP on the 17th was to be contested in court by the land defenders the very next day. “We did nothing wrong. It should never have happened,” Clair tells the Halifax Media Co-op. Clair believes that the RCMP attack was unprovoked and broke an earlier promise on the evening of October 16th by indigenous RCMP “negotiators”. Resistance by the Mi’kmaq, Acadians, and English-speaking settlers near Rexton made fracking a high profile issue in last Fall’s New Brunswick provincial election. A shale gas moratorium was put in place by the Liberals shortly after the defeat of pro-fracking Conservative premier David Alward, but the charges against the land defenders stuck. Clair is asking for help to finance her legal defence. Whereas a few Mi’kmaq charged in 2013 received the support and services of Elispogtog First Nation band lawyer (and former provincial attorney general) T.J. Burke, Clair is on her own. Clair estimates that mounting a legal defence for her minimum two-day trial will cost around $7000. The fight against fracking in Kent County and Elsipogtog was never just a local issue, she says. It energized environmentalists and ordinary citizens everywhere in the Maritimes in the battle against hydraulic fracturing. It sent a message to companies looking to engage in fracking on Canada’s east coast that they had better think twice – and to expect resistance. Now, Clair hopes that people will remember that. “I didn’t do this to be famous,” says Clair. “I am doing this to protect the water, the air and the land. A silent auction to raise money for Clair’s legal fees will be held at the Mi’kmaq Native Friendship Centre in Halifax this Sunday April 12th. Posted on April 9, 2015, in Uncategorized and tagged Annie Clair, anti-fracking New Brunswick, Elsipogtog First Nation, legal defence, Mi’kmaq. Bookmark the permalink. 2 Comments. Reblogged this on Leftist Views and News.